Published 2007. 36 pages, A5, illustrated. 1) TQ 329554. About 300 yds west of The Golden Lion and approximately at the southern ends of Wood Lane and Heath Road. 2) TQ 325563. Only shown on the Rowed map. Phillip Burkin of Chaldon who died on 30 January 1934 remembered the mill being pulled down. All Chaldon corn was ground at the Caterham windmill and the offal was taken to the two windmills on Coulsdon Common. Beadle’s Mill – TQ367586. About 60 yds south of Mill House on the same side of ChelshamRoad, formerly Mill Lane. An old post mill existed near The Hare and Hounds, and the site is preserved by ‘Mill House’ and the open heath below, called ‘Mill Common’. 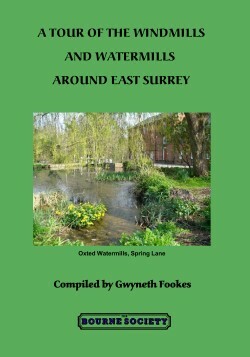 Chelsham mill is marked on Rocque’s map in 1764, and was burnt down in about 1840. We learn from a parish register that Philip Lacres, aged 32, miller, was killed by the mill sail at Chelsham in 1803. John Phillipson purchased the property (Sale Notice, Croydon Library) for £710 in March 1827 at a time when the mill was described as being in excellent repair and so well equipped that it would have cost £800-£1000 to construct. It had two pairs of stones, ‘patent spring’ sails, and was described as ‘twenty-four feet in her Crossbeams’ (crosstrees). Also engraved are the names of some of the craftsmen involved, and a rather stylised smock mill.